Photos courtesy of Heidi Bohnenkamp. Miriam Grill’s Columbia University thesis production of Medea set one of classical mythology’s most infamous murders in the simultaneously intimate and epic space of a bathing chamber. This highly physical production interrogated the intensity of women’s rage, the effects of xenophobia upon a community, the powers and threats of language, and the reclamation of one’s birthright. As dramaturg, Annie worked with the creative team to emphasize Euripides’ storytelling through movement by the ensemble and complex production elements. Roberta Ahrens as Nina and James Tison as Treplev. When it comes to an artist’s ambition, what’s love got to do with it? A bold new staging of Christopher Hampton’s translation of The Seagull challenges expectations of a seemingly-familiar story in ways that delight, surprise, and beguile. Previously a Chekov skeptic, Annie dived headfirst into interpreting the narrative of The Seagull in a way that she and Jonathan felt would resonate with audiences of today. Through a combination of creative casting, intensive table work, letting the discoveries in the rehearsal room guide the final product, and a little karaoke, the cast and creative team introduced our audiences to a new relationship with the text. Annie also spearheaded the artistic design of the marketing collateral, designing a polished, unified aesthetic based off of avant-garde and counter-culture musical artists of the late 70s and 80s. The cast of Two Mile Hollow, featuring Rinabeth Apostol, Greg Ayers, Sean Fenton, Karen Offereins, and Michelle Talgarow. Sean Fenton as Derek Donnelly as The Baboon in The Starfish and the Baboon (set piece). A simultaneous world premiere with First Floor Theater (Chicago), Artists at Play (Los Angeles), and Mixed Blood/Theatre Mu (Minneapolis), Yale Drama Series Prize-winner Leah Nanako Winkler's biting comedy delights and challenges our notions of how an American family is defined, and to whom their stories belong. A pan-Asian cast plays an upper-class white family thrown into chaos, lust, and spite with the intrusion of a "diverse" personal assistant upon their palatial summer home in the East Hamptons. As dramaturg, Annie primarily focused on grounding the humor of the performance through text work so that the comedy--whether physical, technical, or textual--served to enhance the storytelling rather than be played simply for laughs. As a Ferocious Lotus company member, Annie also designed the marketing collateral for the production, a set piece (pictured above), and provided pre-production and production photos. Read more about the production here! The Ensemble of Richard III. Photo by Rob Strong. Katie Mack as Richard of Gloucester. Photo by Rob Strong. Under the direction of Nana Dakin, this all-female production of Richard III at Columbia University School of the Arts tells the story of an underdog who wants to be exceptional. Utilizing the iconographies of kingship and sportsmanship, fifteen actresses explore and challenge historical western structures of gender and power through their own bodies and Shakespeare's enduring language. Annie was involved in the casting, production design, and dramaturgy of gender/race/ability within this abstracted world. Al Patrick Jo as Tang Meng/Dan and Stefani Kuo as Abby. Photo by Elvin Hu. The Cast of Speaking As Then. Photo by Elvin Hu. 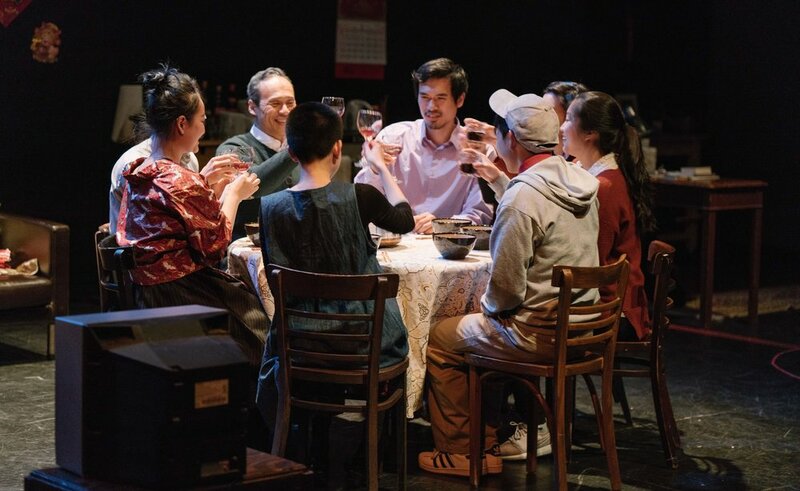 For the premiere of Speaking As Then, a new play by Ruoxin Xu, Annie tapped into her background and family history to serve as script and production dramaturg on this deeply personal story about a Chinese family reuniting in Beijing during Lunar New Year. 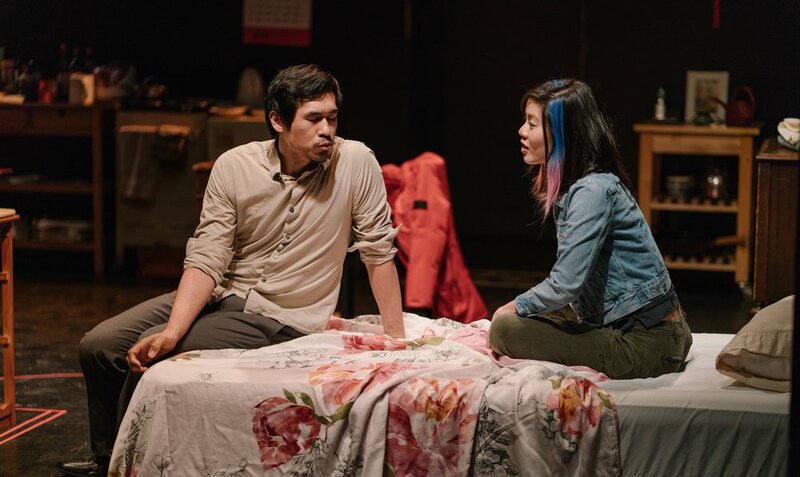 In addition to compiling research around the June 4 protests and traditional Beijing new year cultural practices, Annie worked with the playwright and director to craft a common theatrical language for this pan-Asian cast. This is their second collaboration; Annie previously served as the dramaturg on Xu's short play, "In the Name of Us", performed in English and Mandarin.